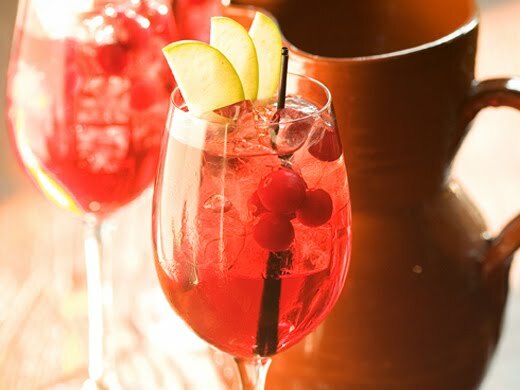 The Secret Diary of a Cute Girl: A Thankful Cocktail! 1. Make simple syrup by bringing all ingredients to a boil while stirring constantly. Strain solids from liquid and discard spices, then set aside to cool completely. 2. Macerate fruit in syrup, triple sec, and port wine at least four hours (preferably overnight, mixture should be soupy). Keep covered and refrigerated until ready to serve. 3. 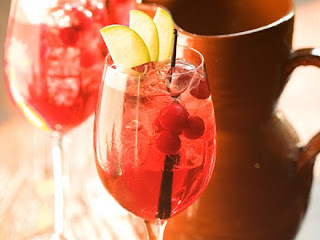 For the base of the sangria, mix wine, simple syrup, port wine, orange liqueur, and cranberry juice. Keep refrigerated until ready to serve. 4. To serve, add macerated fruit to wine mixture. Gently stir. Fill glasses with ice. Scoop 2 tbsp. of the fruit mixture and its juices over the ice! Pour wine mixture into glasses and garnish with an apple chip.